Recently Projects Abroad have been approached by an increasing number of Girl Guide groups looking to travel abroad in order to positively impact the lives of those less fortunate than themselves. Projects Abroad can offer Guides the opportunity to volunteer in other nations and spread desire to make a difference around the world. Projects Abroad has been specialising in arranging volunteer placements in the developing world since it was founded in 1992. There are a broad range of volunteer trips that can be joined by a Girl Guide group and volunteers often combine a few different elements on one project. The group could spend a week teaching children English in a school in Ghana and the next helping to build a medical facility for a local community. Projects Abroad recognises that every group will have their own aspirations for a project, so we offer you the chance to customise your placement - choosing where you go, how long for and when you want to leave and return. You tell us your time frames and we will fit these in with the needs and requirements in our destination countries. 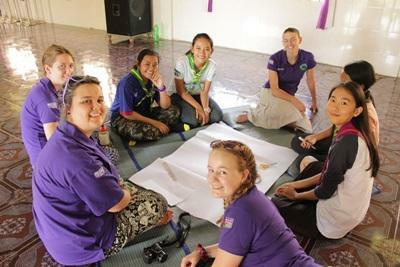 Several groups have taken part in Care and Community Projects across the world; Slough Girl Guides travelled to Nepal, Midlands Girl Guides took a trip to Sri Lanka and Anglia Girl Guides ventured to Cambodia! Have a look at our Case Study page to discover which Girl Guide groups have already taken part in our unique group projects. Since 1992 we have sent over 100,000 volunteers from each corner of the globe to hundreds of different projects across 29 destinations and volunteering as part of a group has grown dramatically during that time. By joining us your group becomes part of a global community working on worthwhile projects and together we have a positive impact on the people we serve, whilst also setting our own lives on a meaningful course.